(White Plains, NY) A world premiere musical performance comes to the Music Conservatory of Westchester this spring! 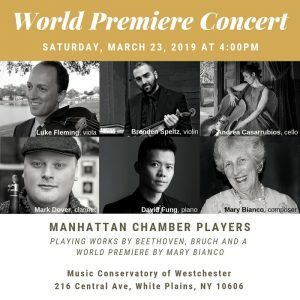 On Saturday, March 23rd, 2019 at 4pm, the Manhattan Chamber Players will perform a new composition by former Scarsdale resident and Conservatory Board member Mary L. Bianco along with musical works by Ludwig van Beethoven and Max Bruch in the Conservatory’s Recital Hall for this free, public concert. The Manhattan Chamber Players are a chamber music collective of New York-based musicians who share the common aim of performing the greatest works in the chamber repertoire at the highest level. Formed in 2015 by Artistic Director Luke Fleming, MCP is comprised of an impressive roster of musicians who all come from the tradition of great music making at the Marlboro Music Festival, Steans Institute at Ravinia, [email protected], Yellow Barn Chamber Music Festival and Perlman Music Program, and are former students of the Curtis Institute, Juilliard School, Colburn School, New England Conservatory, and Yale School of Music. At the core of MCP’s inspiration is its members’ joy in playing this richly varied repertoire with longtime friends and colleagues, with whom they have been performing since they were students. Building upon that foundation, new works commissioned from its composer members keep the ensemble firmly grounded in the music of both the past and present. Its roster allows for the programming of virtually all the core string, wind, and piano chamber music repertoire—from piano duos to clarinet quintets to string octets. Upcoming seasons add tours of Israel, France, and China to MCP’s busy concert schedule in NYC and across the U.S.
For more information about this concert event and the Music Conservatory of Westchester, please contact Adriana Rivera, Communications and Development Assistant, at [email protected] or 914-761-3900 x135. This entry was posted in Press Releases and tagged chamber music, classical music, composition, concert, Manhattan Chamber Players, Mary Bianco, music, music conservatory of westchester, performance, World Premiere. Bookmark the permalink.